Welcome! This page contains basic information about teaching dance at Metronome as an independent instructor. Want to schedule floor time? Teaching and practicing at Monte Cristo is now by appointment only. I'm setting up an online system so you can easily reserve floor time. The plan is to have the more popular teaching times available. It's a work in progress, so please be patient and contact me if you have any questions. 1. Pre-purchase a package. Contact Michelle if you don't already have a package. 2. Log into Metronome's MindBody App. This link is also on the WELCOME page of this website. 4. 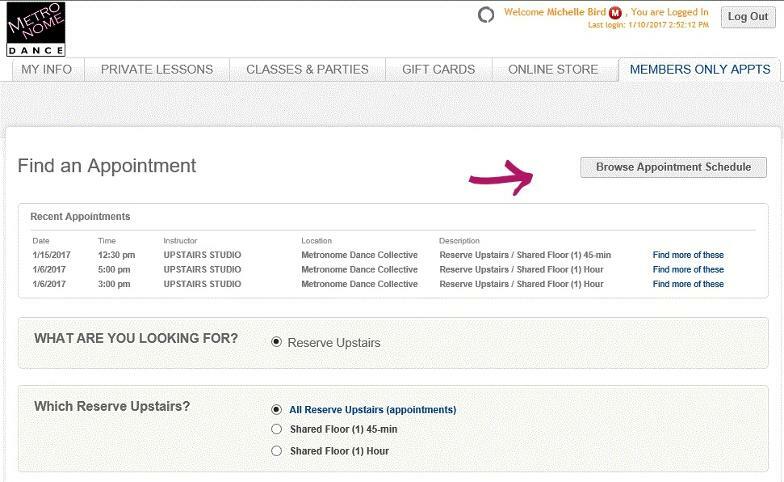 The Browse Appointment Schedule button is rather helpful. Or you can Search by day and time.